This jacket was entered into the Tempore Atlantia Competition at Spring Coronation 2014, in Lanexa, VA. 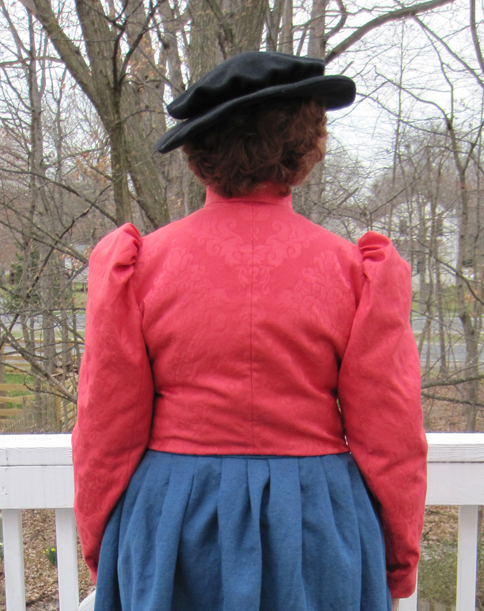 In late 15th-century Germany, women’s fashions were incorporating cuts and colors that had an English flavor. Fashionable colors were becoming lighter yellows and pinks. Trade with Italy meant that a variety of fabric types was available for tailors to use, including jacquard. 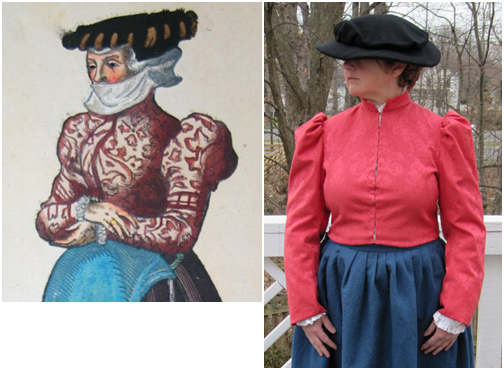 The jacket I have recreated is based on an historic image by Hans Weigel from 1577 where English influences are evident. The sleeves are puffed and the jacket lacks the normal German guards along the center front. Instead of black and brown woolens popular with Catholic and Protestants (respectively) earlier in the century, this jacket is pink or salmon colored. The skirt and hat that I am wearing are for context only. They are English, not German. I intend to make the entire German outfit. Looking at historic portraits, the fashion for puffed sleeves appears in the 1550s portraits of Eleanor of Toledo. In a more exaggerated form, we see it in the portrait of Catherine of Austria, Queen of Portugal by Antonio Mor, c. 1552. 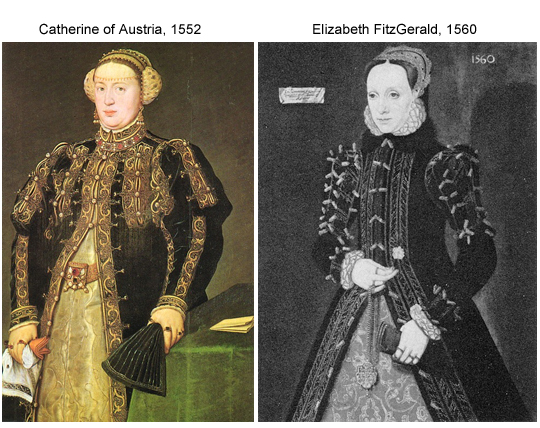 As the century progresses, puffed sleeves that are of a smoother configuration are seen in portraits of Elizabeth FitzGerald, Countess of Lincoln by Steven van der Muelen, 1560, Margaret Audley, Duchess of Norfolk by Hans Eworth, 1562, and Anne Browne, Lady Petre, attributed to Steven van der Meulen, 1567. The sleeves on these women are in the shape of the German sleeves, but far more decorated. 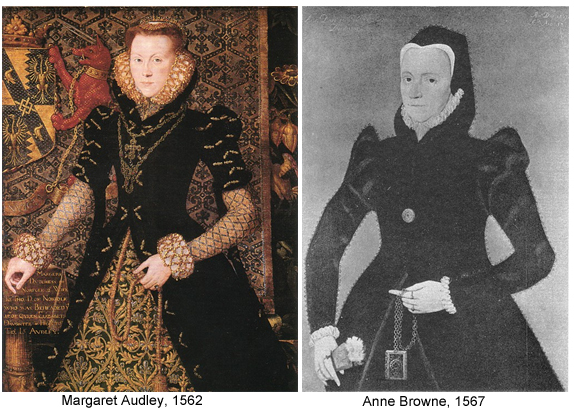 The best equivalent sleeve shape found in an English drawing is the shape of the sleeve on the woman on the left in the Lucas de Heere image, c. 1570-75. The influence on the German sleeve is evident when compared to the German image. Germany was a far more conservative location than England, France or Italy, and therefore, this jacket is closed up to the neck and the arms are completely covered following city ordinances and sumptuary laws. However, German women began to find ways to be fashionable using color. Another difference between German and English versions of this fashionable bodice is the fact that German women were not wearing the same foundation garments that flattened out the bosom. As you can see from the images above, the German woman has a more rounded appearance while the English women are flatter. To my knowledge, there are no extant German jackets similar to the jacket discussed in this paper. Janet Arnold’s Patterns of Fashions books are my reference for sewing techniques. After the body block was complete, the sleeves were made using the same method. In period, a tailor would have made this garment using a pattern from a tailor’s book. An example of a master tailor book can be found on Drea Leed’s website here: http://www.elizabethancostume.net/schnittbuch/index.html. It is the Leonfeldner Schnittbuch, which currently resides in the Stadtmuseum in Linz, Germany. In the next few months, another German master tailor’s book will be published by Marion McNeely and Katherine Barich. The Leonfeldner book does not contain any patterns for the jacket I have recreated for this competition: I am merely referring to this book as an example of what was being used as a pattern book in general during the late 15th century. Damask, linen, thread, metal hooks and eyes. Damask, linen, and metal hooks and eyes are period materials. As is shown in the image I used as my inspiration, I chose to make my jacket out of monochromatic damask. The same fabric would have been used in the 16th century Germany, though the quality would have been superior. I have carpel tunnel syndrome, so all the hidden seams were sewn by machine so as to not stress my hands. The finish work was done by hand. 1. First, the body block was sewn together and the collar attached. 2. The body block was lined. 3. All the seams were finished by hand. 4. The sleeve fashion fabric and lining were sewn together at the cuffs. 5. The outside sleeve was attached to the body block. 6. The sleeve lining was then sewn down by hand to the inside body block to hide all raw edges. 7. Lastly, the hooks and eyes were added. 1. Arnold, Janet. 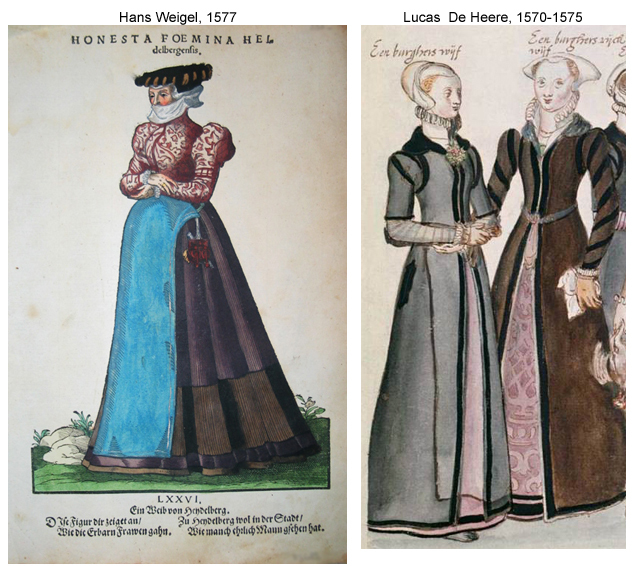 The Patterns of Fashion: The Cut and Construction of Clothes for Men and Women C1560-1620. Drama Pub, May 1985. 2. Leed, Drea. (Translation by Katherine Barich). Leonfeldner Schnittbuch. http://www.elizabethancostume.net/schnittbuch/index.html. 3. McNeely, Marion. (Mistress Sophia Kress). Pattern drafting. http://www.curiousfrau.com/patterns/pattern-drafting/. 4. Rublack, Ulinka. Dressing Up: Cultural Identity in Renaissance Europe. Oxford University Press, 2010. 5. Tudor & Elizabeth Portraits. http://www.elizabethan-portraits.com/. 6. Weigel, Hans. Kostüm Altkol Holzschnitt, 1577.